Aussie Millions - The Final Countdown! 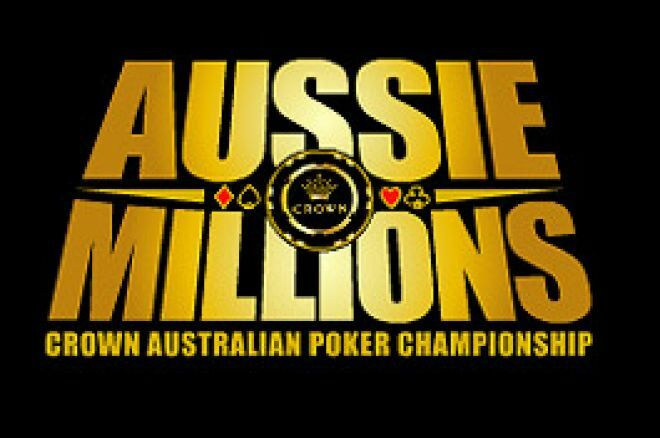 The Aussie Millions A$10,000 No Limit Hold'em Main Event at the Crown Casino, Melbourne, is cranking up to its finale with the action down to the last seven. Of the original 418 entrants, the end of Day 3 saw this whittled down to the last 36. There were 48 paying spots for the field to aim for, so those left on short stacks were comforted in the knowledge that they were walking with a minimum pay day of A$16,720, enough to pay for the buy-in and cover expenses! Places 37 - 48 had received $12,540 each and this list included three British players, Tony "The Lizard" Bloom (2004 Aussie Millions winner), Willie Tann (2nd in the A$3,000 Pot Limit Omaha this week in Melbourne) and Harry Demetriou (winner of over $100,000 in five events in two years). Good play by all yet, as driven professionals, there is probably some disappointment at having travelled so far and got so far, only to fall short of the big prizes. The remaining 36 included chip leader, Kenna James (USA), a regular big money winner, Stateside. He sat down with 700,500 in chips having taken a huge pot from the 2005 Aussie Millions champ, Jamil Dia, and eliminating him in the process. Dia had gambled his all on a board showing 7744 only to find James with K7. Other chip heavyweights included two Australian locals, Gerry Fitt (567,000) and Russell Davies (489,000), the latter having qualified for this tournament in August in a A$1,000 satellite at the Crown Victorian Poker Championships 2005 in the same casino. A 20 year old American student, Shannon Shorr, not yet old enough to play in the States, was tucked in with 337,500. The big names from the States still fighting included Antonio Esfandiari (236,500), Michael Gracz (396,000) and Kathy Liebert (109,000). The blinds were still small enough not to force too much gambling but when action took place it was frenetic and soon we were down to the last 18. Gerry Fitt had pushed on strongly to 1,300,000 and the American student Shorr was up to 800,000. Michael Gracz was by this time on the rail having earlier pushed all-in and been called and eliminated by Kathy Liebert. However, having elevated her chip count, Liebert eventually came unstuck pushing in with K 10 only to be called by big stack, Kenna James, holding AK. Liebert went out in 13th place taking away A$33,440. The next one out now would now receive over A$50,000. The first big action saw Lee Nelson double up with KK against Kenna James' A9. Soon after, another KK, this time held by Nenad Medic, eliminated Baca Cruz in 12th place. Pocket Queens was next to deliver a knockout blow, wielded by Wes Bugiera. The victim, Antonio "The Magician" Esfandiari, had run out of tricks. A measure of how volatile chip stacks can be at this stage of a tourney came when Mark Vos found himself down to 100,000. With KK he tripled up against two callers, then doubled that up with JJ two hands later against 88. Suddenly Vos owned 700,000 and was back in the thick of it! Shannon Shorr doubled up against Gerry Fitt, who was now severely damaged having earlier had a healthy lead. Likewise, Lee Nelson's KK took a chunky bite out of Kenna James' stack who showed AQ. Then Mark Vos slowplayed AA and was stranded on the river after Lee Nelson called him down and then bet out on a board showing 3KT3K for a 900,000 pot. Shorr was now up and down like a yoyo and found himself low once again. Not to be denied, Shorr promptly doubled through against fellow American Jeff Sealey, then eliminated Gerry Fitt in 10th place with AA and again doubled through Sealey, who still had a healthy pile despite this double blow. Then we saw the kind of hand that has on-line players choking on their coffees when it happens to them. Kenna James was dealt Ac Kc. Having been put all-in by Nenad Medic, he eventually called and saw Medic turn over Qh Qs. The flop came down Qc Qd Tc. Medic had quads, James had a Royal Flush draw! He needsed the Jc to stay in the tournament but it failed to show although another club did. The nut flush was not good and another former chip leader bit the dust. The final elimination on Day 4 befell Australian Mark Vos, once again at the hands of Shannon Shorr, who at this rate will be returning to the USA glad he dropped out of college! Shorr caught a heart on the river and dealt the fatal blow to Vos. Skip back to UK Poker News for the Final results tomorrow! Ed note: Scale the heights with Everest Poker and receive $50 extra on a $50 deposit.